Let basic be beautiful each time you wear this Bella Dress Black by Jatine. It’s made in a fitted style, much like bodycon – only better. It features a scooped back and center back zip with a slit. 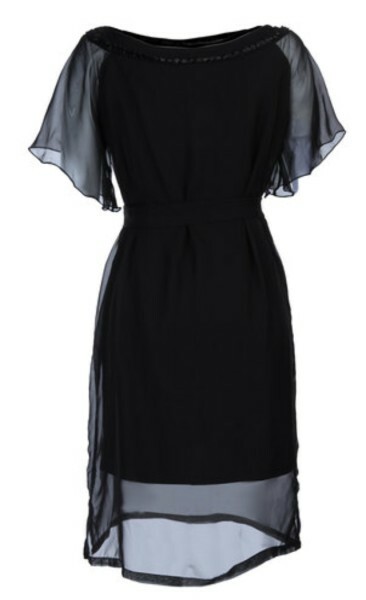 This dress is simple, chic and on trend with bell chiffon sleeves and an over-the-knee hemline. 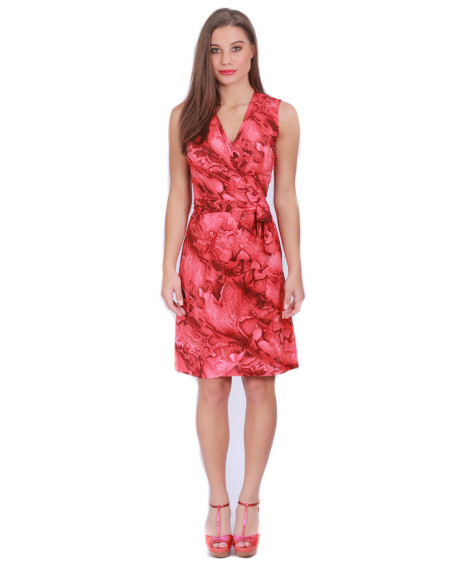 It can be worn to a ladies luncheon or dressed up for a night out on the town. 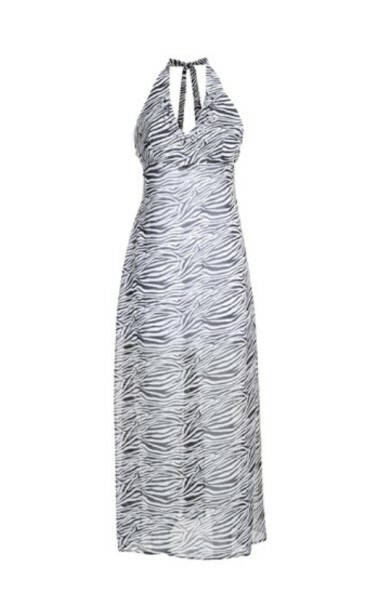 The Juliette Maxi Dress is a v-neckline halterneck maxi dress. 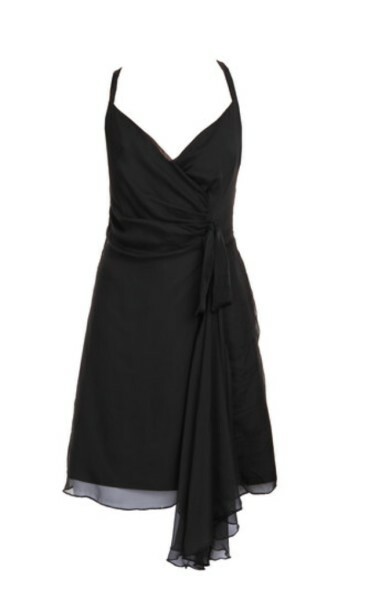 The chiffon ties softly around your neck to secure the dress with a center back zip closure. It also features an empire line fit over the bust. It's lined just above the knee and the chiffon hemline is ankle length. The hand beading is done by highly skilled women from all around South Africa - making each garment slightly different from the other - unique and personalised. 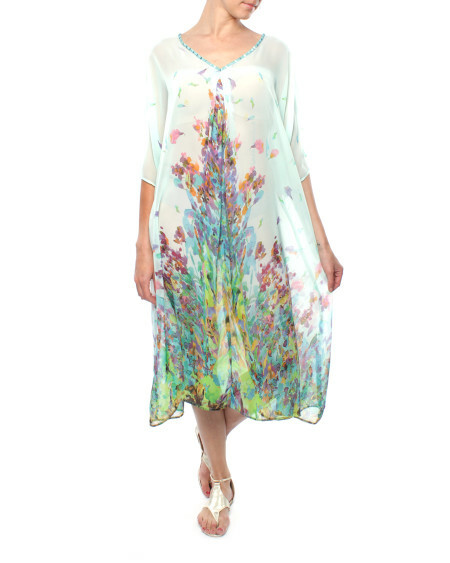 Get your hands on the Positano Kaftan Green Floral Print by Jàtine this summer. This v-neckline kaftan with a high-low hemline has sleeves-to-elbow with slit detail. The stunning hand beaded neckline is made by highly skilled women from around South Africa. Each garment has slightly different beading making it unique and personalised. The chic Jatine Camile Top Blush Pink is a must-have for the season. It features spanish lace sleeves and pocket detail with a scuba fabric for complete comfort. It has a straight A-line fit against the body with the longer hem at the back. Dress it up with a pair of the Jatine Koko Blush Leggings and your fav heels for a night out. 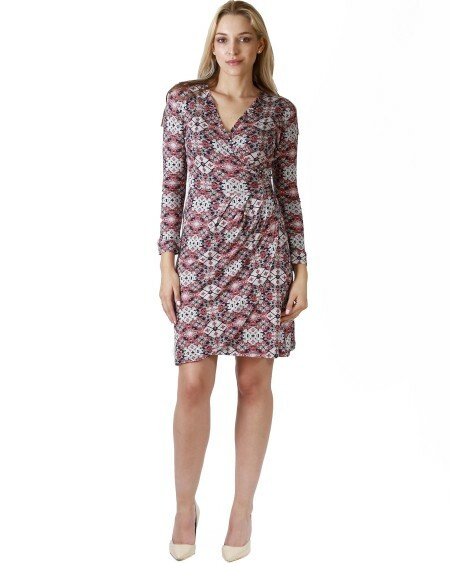 The Maria Dress in Burgundy print is cut to skim the shape of the body with a cowl neckline, the hemline finishes just about the knee. It can be paired with a stunning pair of heels for a formal occasion or dressed down with a denim jacket & sandals. The stretch slinky material doesn't crease so it the perfect holiday go to dress. The Milana Dress Black is a glam boat-neckline shift dress with raglan sleeves, straight fit with an over-the-knee hemline. There is an optional sash tie belt to style the dress into the waist or on the hip. The hand beading is done by highly skilled women from all around South Africa - making each garment slightly different from the other - unique and personalised. The chic Jatine Camile Top Black is a must-have for the season. It features spanish lace sleeves and pocket detail with a scuba fabric for complete comfort. It has a straight A-line fit against the body with the longer hem at the back. Dress it up with a pair of the Jatine Koko Black Leggings and your fav heels for a night out. 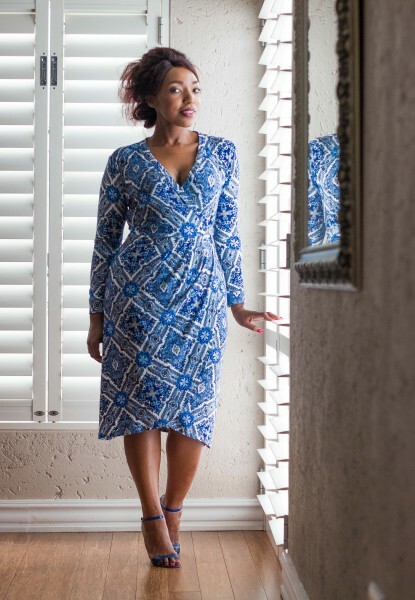 The Chelsea Wrap Dress in Blue & White Print is an essential in any women's wardrobe, it can be worn for work or dressed up for a night out on the town . It's a full length sleeve wrap dress, it features stunning pleats over the body on the front of the dress - accompanied with a soft sash tie belt. The hemline to just below the knee and 60cm from the waist. The Kirsten Maxi Dress Pink Snakeskin Print is a v-neckline maxi dress with 3,5cm wide straps and center back zip closure. It is lined above-the-knee with the chiffon hemline at ankle length. It is fitted over the bust and straight line over the rest of the body accompanied with side seam pockets. The hand beading is done by highly skilled women from all around South Africa - making each garment slightly different from the other - unique and personalised. The Soho Shirt Dress in Peach & Melon Print is an essential in any women's wardrobe, it can be dressed up for work or dressed down for a casual, yet stylish weekend look . It's a full length sleeves can be rolled up and button on the sleeve for a more relaxed effect. It is accompanied with a soft sash tie belt to add additional detail to the look. 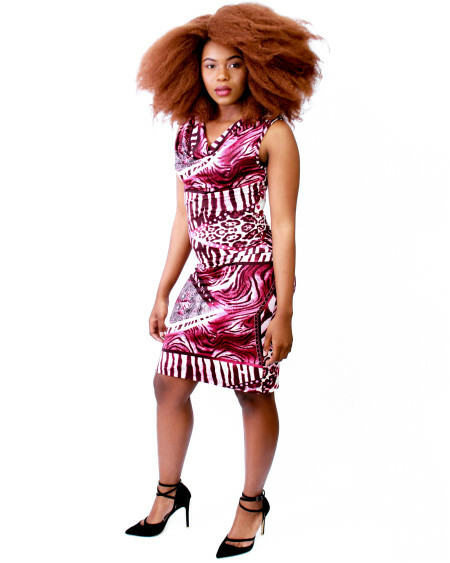 The hemline is curved & sits just below the knee and 60cm from the waist. Add a glam pair of heels to this look and you're ready to turn heads. The Maria Maxi Dress in Turquoise print is cut to skim the shape of the body with a cowl neckline & front side slit. 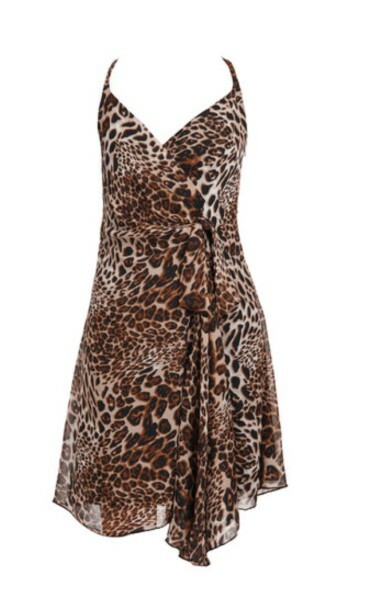 It can be paired with a stunning pair of heels for a formal occasion or dressed down with a denim jacket & sandals. The stretch slinky material doesn't crease so it the perfect holiday go to dress. The Soho Shirt Dress in Blue & Mint Print is an essential in any women's wardrobe, it can be dressed up for work or dressed down for a casual, yet stylish weekend look . It's a full length sleeves can be rolled up and button on the sleeve for a more relaxed effect. It is accompanied with a soft sash tie belt to add additional detail to the look. 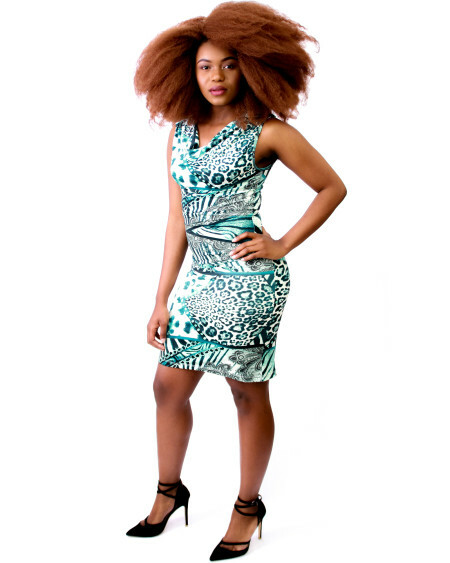 The hemline is curved & sits just below the knee and 60cm from the waist. Add a glam pair of heels to this look and you're ready to turn heads. The Bianca wrap dress is sleeveless, fits into the waist with tie sash belt giving the dress a V-neckline. 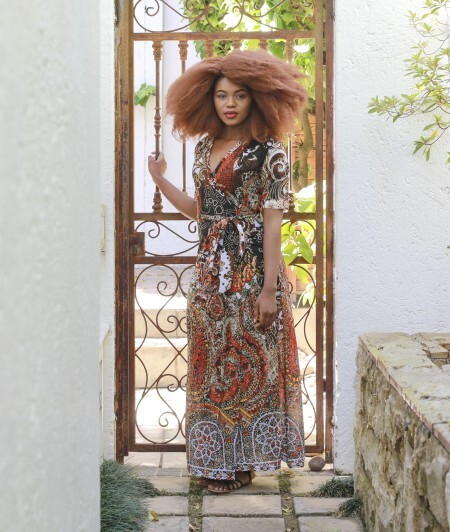 The hem finishes just over the knee, it's the perfect summer dress to wear with a pair of sandals for Saturday braai or dress it up with a pair of heels for a night out! 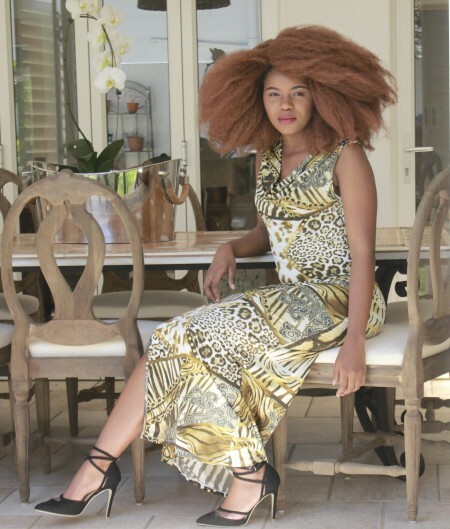 The Maria Maxi Dress in Gold print is cut to skim the shape of the body with a cowl neckline & front side slit. It can be paired with a stunning pair of heels for a formal occasion or dressed down with a denim jacket & sandals. The stretch slinky material doesn't crease so it the perfect holiday go to dress. The Chelsea Wrap Dress in Black & Gold Print is an essential in any women's wardrobe, it can be worn for work or dressed up for a night out on the town . It's a full length sleeve wrap dress, it features stunning pleats over the body on the front of the dress - accompanied with a soft sash tie belt. The hemline to just below the knee and 60cm from the waist. 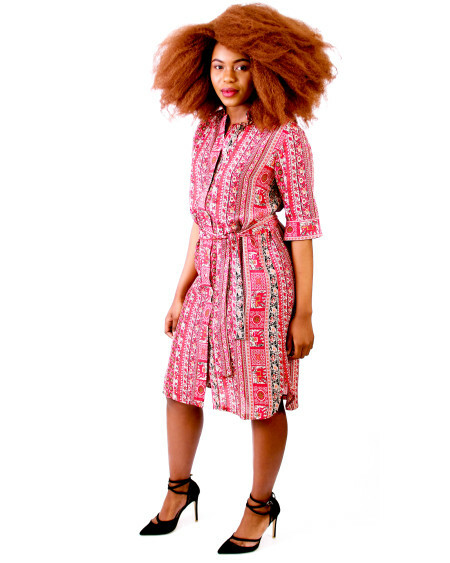 The Chelsea Wrap Dress in Navy & Pink Print is an essential in any women's wardrobe, it can be worn for work or dressed up for a night out on the town . It's a full length sleeve wrap dress, it features stunning pleats over the body on the front of the dress - accompanied with a soft sash tie belt. The hemline to just below the knee and 60cm from the waist. The Maria Dress in Gold print is cut to skim the shape of the body with a cowl neckline, the hemline finishes just about the knee. It can be paired with a stunning pair of heels for a formal occasion or dressed down with a denim jacket & sandals. The stretch slinky material doesn't crease so it the perfect holiday go to dress. Jàtine Koco Leggings Black are the ultimate basic for Autumn-Winter. They fit into the waist with a 2cm elastic waistband and won't ride down. Made from a super comfortable fabric, you'll want to live in these babies. The leggings are sure to make a statement paired with the Nikki Black top or Camile Black top. The Siena Dress is a cross-over chiffon dress with flared insert on the one side and has chiffon tie detail. The criss-cross detail at the back is 1,5cm straps with side zip closure to make it easy to put on and take off. Glam it up with stunning heels for a night out. Jàtine Koco Leggings Animal Print are the ultimate basic for Autumn-Winter. They fit into the waist with a 2cm elastic waistband and won't ride down. Made from a super comfortable fabric, you'll want to live in these babies. The leggings are sure to make a statement with a black shirt, paired with cute booties. 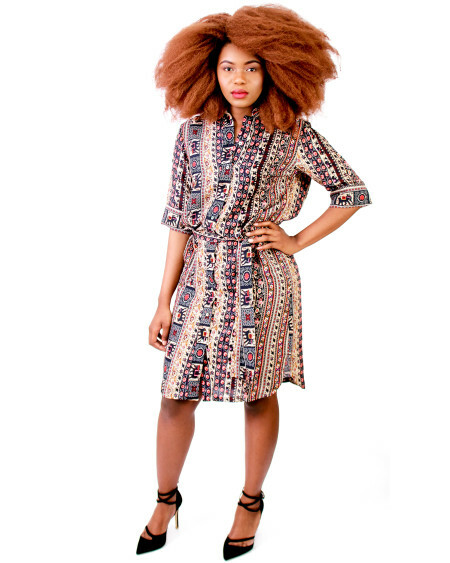 It's a 3/4 sleeve wrap dress with waist band detail. It features stunning pleats over the bust and body on the front of the dress - accompanied with a soft sash tie belt. The hemline to just above the knee and 54cm from the waist. Strut your stuff in this Mykonos Shift Dress Black by Jàtine. It features a scooped round neckline with soft chiffon cap sleeves and waterfall drape detail over the bust as well as a front panel. The straight fit follows lines of the body and is an over-the-knee-length beauty. The garment is made from bon bon and chiffon for true comfort. The Chelsea Wrap Dress in Black & White Geometric Print is an essential in any women's wardrobe, it can be worn for work or dressed up for a night out on the town . It's a full length sleeve wrap dress, it features stunning pleats over the body on the front of the dress - accompanied with a soft sash tie belt. The hemline to just below the knee and 60cm from the waist. The Chelsea Wrap Dress in Black Polka Dot is an essential in any women's wardrobe, it can be worn for work or dressed up for a night out on the town . It's a full length sleeve wrap dress, it features stunning pleats over the body on the front of the dress - accompanied with a soft sash tie belt. The hemline to just below the knee and 60cm from the waist. Jàtine Koco Leggings Zebra Print are the ultimate basic for Autumn-Winter. They fit into the waist with a 2cm elastic waistband and won't ride down. Made from a super comfortable fabric, you'll want to live in these babies. The leggings are sure to make a statement with a white or black shirt, paired with cute booties. The Toni wrap dress has sleeves which finish just above the elbow, fits into the waist with tie sash belt giving the dress a V-neckline. The hem finishes at the ankle, it's the perfect summer dress to wear with a pair of sandals for Saturday braai or dress it up with a pair of heels for a daytime wedding! 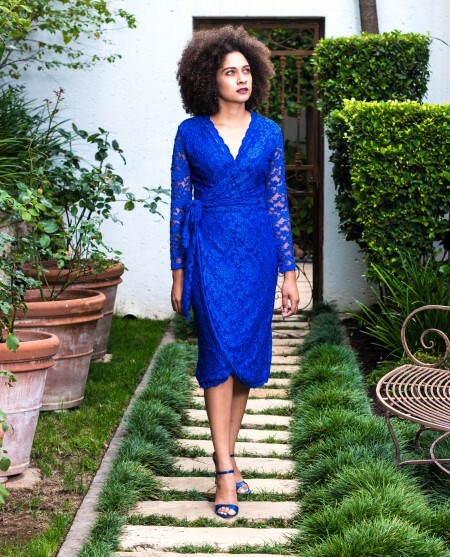 The Tiffany Lace Wrap Dress in Royal Blue is an essential in any women's wardrobe, it can be worn for work or dressed up for a night out on the town . It's a full length sleeve lace wrap dress, fully lined except for the sheer lace sleeves accompanied with a soft sash tie belt. The hemline to just below the knee and 60cm from the waist. Add a glam pair of heels to this look and you're ready to turn heads. Jàtine Koco Leggings Blush are the ultimate basic for Autumn-Winter. They fit into the waist with a 2cm elastic waistband and won't ride down. Made from a super comfortable fabric, you'll want to live in these babies. The leggings are sure to make a statement paired with the Camile Blush top. 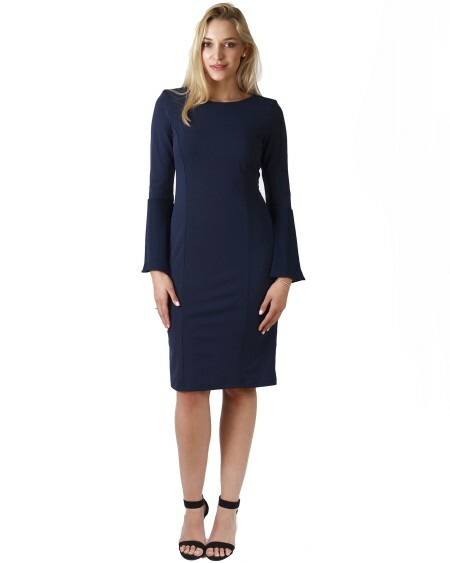 The Milana Dress is a glam boat-neckline shift dress with raglan sleeves, straight fit with an over-the-knee hemline. There is an optional sash tie belt to style the dress into the waist or on the hip. The hand beading is done by highly skilled women from all around South Africa - making each garment slightly different from the other - unique and personalised. The Jatine Claudia Shirt Dress Black Elephant Print is the new in-thing this season. The garment features a center button stand with a chinese collar. It's a straight fit with a curved hemline and optional tie sash belt if you'd like to accentuate your waist. It's perfect for the office or a casual shopping day around town. Jàtine Koco Leggings Cappucino are the ultimate basic for Autumn-Winter. They fit into the waist with a 2cm elastic waistband and won't ride down. Made from a super comfortable fabric, you'll want to live in these babies. The leggings are sure to make a statement paired with the Nikki Blush top. The Chelsea Wrap Dress in Black is an essential in any women's wardrobe, it can be worn for work or dressed up for a night out on the town . It's a full length sleeve wrap dress, it features stunning pleats over the body on the front of the dress - accompanied with a soft sash tie belt. The hemline to just below the knee and 60cm from the waist. The Chelsea Wrap Dress in Navy is an essential in any women's wardrobe, it can be worn for work or dressed up for a night out on the town . It's a full length sleeve wrap dress, it features stunning pleats over the body on the front of the dress - accompanied with a soft sash tie belt. The hemline to just below the knee and 60cm from the waist. Get your hands on the Positano Kaftan Cream Floral Print by Jàtine this summer. 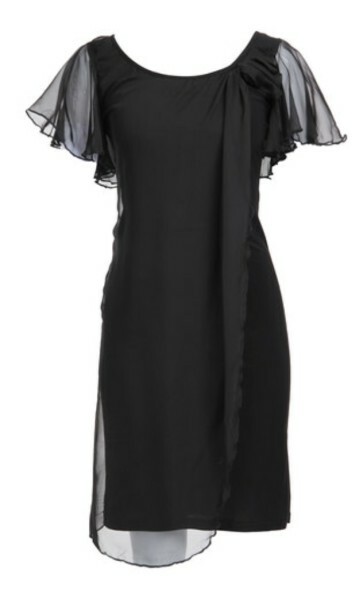 This v-neckline kaftan with a high-low hemline has sleeves-to-elbow with slit detail. 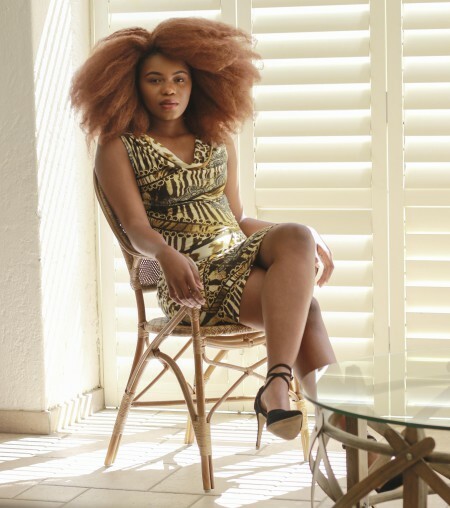 The stunning hand beaded neckline is made by highly skilled women from around South Africa. Each garment has slightly different beading making it unique and personalised. The Chelsea Wrap Dress in Zebra Print is an essential in any women's wardrobe, it can be worn for work or dressed up for a night out on the town . It's a full length sleeve wrap dress, it features stunning pleats over the body on the front of the dress - accompanied with a soft sash tie belt. The hemline to just below the knee and 60cm from the waist. 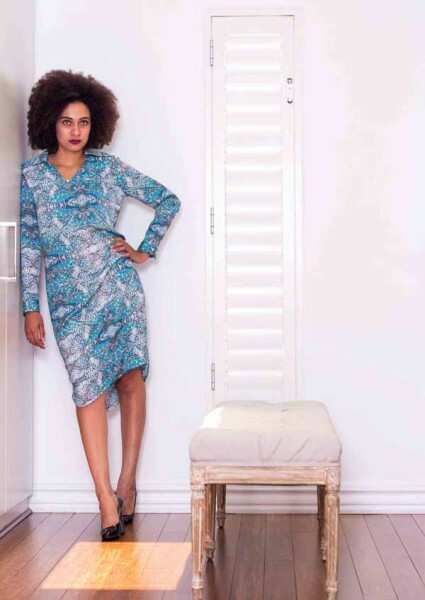 The Chelsea Wrap Dress in Turquoise & White Print is an essential in any women's wardrobe, it can be worn for work or dressed up for a night out on the town . It's a full length sleeve wrap dress, it features stunning pleats over the body on the front of the dress - accompanied with a soft sash tie belt. The hemline to just below the knee and 60cm from the waist. Get your hands on the Positano Kaftan Pink Floral Print by Jàtine this summer. This v-neckline kaftan with a high-low hemline has sleeves-to-elbow with slit detail. The stunning hand beaded neckline is made by highly skilled women from around South Africa. Each garment has slightly different beading making it unique and personalised. 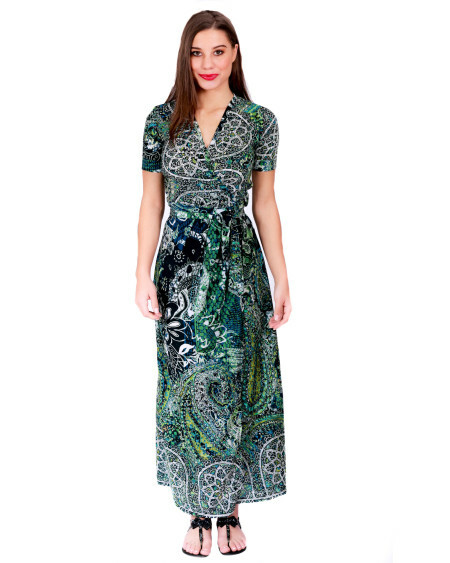 The Maria Dress in Turquoise print is cut to skim the shape of the body with a cowl neckline. It can be paired with a stunning pair of heels for a formal occasion or dressed down with a denim jacket & sandals. The stretch slinky material doesn't crease so it the perfect holiday go to dress. 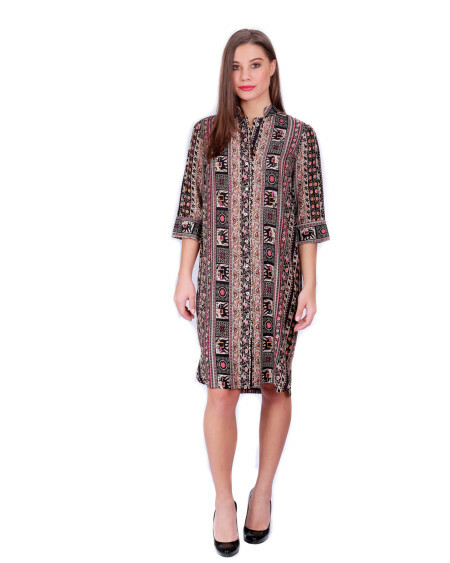 The Jatine Claudia Shirt Dress Red Elephant Print is the new in-thing this season. The garment features a center button stand with a chinese collar. It's a straight fit with a curved hemline and optional tie sash belt if you'd like to accentuate your waist. It's perfect for the office or a casual shopping day around town.